I’m in the “tantrum” years right now and I find a correlation between being hungry and the frequency and duration of tantrums. So I feed and offer drink liberally around my house. In fact, I feel like all I do is feed somebody most of the day. At school my room is across the hall from a drinking fountain and I make sure to offer water as often as I can. I have seen teachers deny students water as punishment! It’s rare to see, but it happens. I don’t do that. If a student needs to drink water, they are allowed to get some. I quickly learn which students try to abuse the privilege and I manage that. 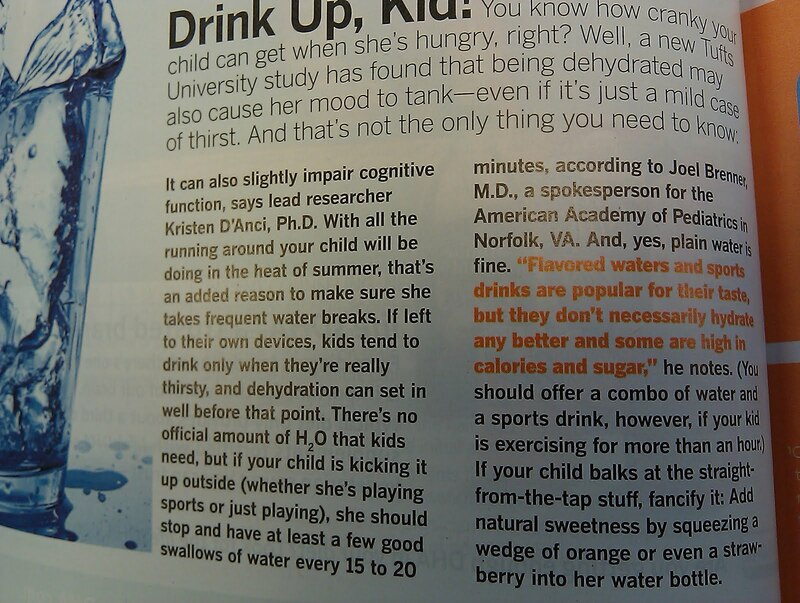 Anyway, if your child or student is acting up, he or she might just need a drink of water! Previous PostOpen thread: VolunteeringNext PostSoup up my lunch: Brie, summer sausage, crackers, spinach salad…and dark honey? In my house too, I feel like my house becomes a drive thru in the summer months. Between snacks, drinks and more snacks, I'm surprised my kids can function in school. I'm not sure if they are truly hungry or if it's the accessibility to the food and drink that they indulge. I just keep healthy snacks for them to choose from. I also keep small containers of fresh fruits and veggies for them in the fridge. I am grateful, that my children are water and drinkers, not soda, not too much juice either. I hope that stays as years go by! I'm 27 years old and I get cranky if I'm dehydrated 🙂 You never grow out of it. My little brother's teacher last year refused to let him keep a water bottle on his desk, even after my mom explained that his medication makes him excessively thirsty. She also refused to let him get up and get drinks during class. So ridiculous! How do you manage students who abuse the privilege, if I may? @swiggett — that's a great question. well, this particular student was overweight too and wanted to drink all the time. Certainly it was to escape work, but since I had read that kids with diabetes have excessive thirst, I thought the issue might be at least partly physiological. So we have set times that we get water and I just stick with the schedule and then get small drinks when returning from various other classes. I always wanted to allow my (HS) students to have water bottles with them, but at least one administration was concerned about there being, er, additives in those bottles. Since we changed classes every hour, I told my students that if they came and checked in with me before the bell rang, they could run to the bathroom or water fountain while I was taking attendance, etc. Many of my athletes used this opportunity every day, and I think they felt I respected them by understanding their need for hydration. Regarding swiggett's question, I did have one student (not an athlete, btw) who abused the privilege, so I gave him a warning and then didn't allow him to do this anymore–I would mark him tardy if he missed the bell. He hated not being able to go! After about 2 weeks I tried again and he was better about it. Hmm, the local high schools quit letting the kids carry water bottles all day because a few kids were bringing alcohol to drink instead of water to school. Some of the private schools banned it too. Don't you hate it when a few ruin something for all? I dislike water fountains…is this the one you clean frequently? At the preschool, we keep a container of water and paper cups in each room. I think it is a great idea, because we aren't making trips to the water fountain, where we use cups anyway, and the kids quickly learn to ask for a drink. I also think that in general we tend to not drink enough water. We have replaced it with juice and soft drinks. Each have their own problems. It really bothers me when I hear that kids are being deprived of things like recess and water as punishment. A well known conservative radio host renamed school "scruel." I wish schools could be more progressive in the way they get positive results from children. It's so archaic and I feel bad that my child has to be in such an institutional, prison-like atmosphere for 7 hours a day. And she's actually in a "better" school district. As an aside, I'm a lunch lady and I just got the elementary menu and (big surprise!) chicken nuggets are being served on the first day of scruel. lol! @Clamco – It should be part of the training that you can't deprive kids of basic needs! That's neat that you are a lunch lady! "Yay for chocolate milk! A new study from Spain suggests that low-fat or skim chocolate milk may have heart-health benefits similar to red wine. Men and women who drank the beverage regularly were found to have higher levels of the good HDL cholesterol and less artery inflammation than those who didn't. So pour your kids their chocolate milk – and spill the guilt"
Once I stopped ranting at their stupidity, I did a quick google search and found this article ( http://www.nytimes.com/2009/11/10/health/research/10nutr.html?_r=1 ) which stated that they had "20-gram sachets of soluble cocoa powder to drink with skim milk twice a day, while the rest drank plain skim milk." When I read that, I'm thinking, "something like Hershey cocoa powder with no added sugar". Totally different than the jug you find in the dairy case or the ready-mixes that are on the shelf. Makes me die a little inside everytime I read stuff like this. Did the Milk Counsel buy them out or something? At my son's school, the kids bring water bottles that they fill up and have available at their desk. Even minor dehydration can cause problems (behavioral tantrums and lethargy being two that are seen in school a lot) Add in that these kids are going from sugar highs to sudden lows and you've created your own disaster. It's sad, but most schools that I've heard about do not allow water bottles without a doctor's note. And, when I was in high school, we weren't supposed to leave class for ANY reason…that included getting water or using the bathroom. Our school kids aren't getting adequate nourishment, exercise, or WATER? Gee, I wonder why so many of them have behavior issues and learning problems. Denying school kids reasonable access to drinking water is just plain mean and should not be tolerated. I cannot imagine a school that does not allow a water bottle in the classroom. But then, I'm in Arizona and we can have water bottles all year round. I remember it not being able to leave the classroom to get a drink when I was in school. I can also remember over heating and throwing up, so stupid to do that kids. When I was in elementary school there was a sink and water fountain spigot right in the classroom. Students were allowed to get up quietly from their desk and get a drink of water when and as they felt they needed to. I don't ever remember there being any abuse of the privilege–probably because it was right in the class room. In junior high and high school we weren't allowed any food or beverages in the classroom. Bathroom breaks and drinks from the water fountains were to be taken care of during class changes (which didn't give one a lot of time!). Heck, I remember, in junior high school, a friend had to turn her T-shirt inside out because of what it said on it–it was the perfume slogan, "Love's Baby Soft"! How things have changed!!!! It's also interesting from a cultural/social standpoint because of what some people said about high schoolers and alcohol. It just wasn't an issue when I was in high school (in Malaysia). Even the "bad kids" would never have dared to sneak alcohol to school in water bottles. There are many things wrong with our school system and only one of them is food and water. But how can you fix anything if you don't start with nutrition!? Thanks so much for all the great comments! In my school, I could count on one hand which water fountains are good. Interestingly, the closer you get to the vending machines (With energy drinks and water), the worse the water fountains' water is. Hmm…. And this blog post made me thirsty. I wish you could be my kid's teacher! As a first grader who does not eat fast (too distracted by things going on around him, as well as chatting to friends), 20 minutes for lunch was never enough. I always packed his lunch, but he would often eat only part. For example, he would have eaten most of the sandwich, but not had the fruit or the soymilk. I repeatedly told the teacher that he would be much better behaved if she would make sure he had all of his lunch, but they didn't have snack time in his class. He ate breakfast at 6:30, and by the time he got home at 3:30, he was cranky and ravenous! About six years ago back when I was a senior in high school, the high school had banned water bottles in classrooms. It always made my head spin since they had the vending machines in the school – but yet no students were to be purchasing out of them and bringing the bottles to class or lunch…what a waste. We had three minute passing periods so finding a working water fountain and using a bathroom in addition to going by one's locker and making it to next class was not even an option since there just wasn't enough time. Don't even get me started on the 20 minute lunches (when it takes 10-15 just to get through line). I agree with a poster above – why not just ask all water bottles be clear (with plain water) and if someone honestly thinks a student is drinking some alcohol poured in there, why not just sniff it? There's no way you wouldn't know then.